CTI Jalgaon (Citizen Technical Institute Jalgaon), Jalgaon published a new job notification for Principal, Branch Manager, Clerk, Teacher, Peon Posts. The recruitment is for total 40 Vacancies. The willing candidates are informed to see the latest notification March 2019. Qualification required 12th/DTP/MS-CIT/Tally/IT/10th/ITI/ANM/GNM and More. Walk-in Interview on 22-03-2019 & 23-03-2019. 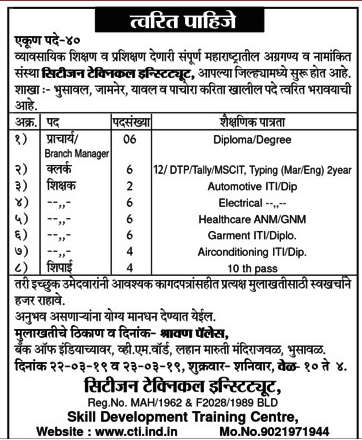 For More details of CTI Jalgaon Recruitment 2019 Read Below. Education Qualification: 12th/DTP/MS-CIT/Tally/IT/10th/ITI/ANM/GNM and More. For Post wise Education Details follow the detailed advertisement. Walk-in Interview on: 22-03-2019 & 23-03-2019.